On Saturday 3 September 2016, the World Head of the Ahmadiyya Muslim Community, the Fifth Khalifa (Caliph), His Holiness, Hazrat Mirza Masroor Ahmad addressed an audience of more than 1,000 non-Ahmadi guests on the second day of the 41st Annual Convention (Jalsa Salana) of the Ahmadiyya Muslim Community in Germany. During his address, His Holiness quoted from the Holy Quran and the practice of the Prophet of Islam (peace be upon him) to disprove allegations that Islam advocates extremism or violence of any kind.His Holiness spoke of the increasing instability in Europe in light of recent terror attacks and the continuing effects of the refugee crisis and the rise of far-right nationalist parties in Europe. His Holiness also referred to the humanitarian activities conducted by the Ahmadiyya Muslim Community in different parts of the world. His Holiness called on both host nations and immigrants to fulfil their responsibilities towards each other. He said genuine refugees should be assisted and supported, whilst the immigrants should seek to contribute to the local society as soon as possible. His Holiness quoted chapter 5, verse 9 of the Holy Quran which calls on Muslims to act with justice and fairness even with a one’s enemies or opponents. His Holiness said that Prophet of Islam (peace be upon him) was the perfect manifestation of this teaching. His Holiness said that the Ahmadiyya Muslim Community sought to establish peace in the world in light of the teachings of Islam. Later in his address, His Holiness spoke about the humanitarian projects run by the Ahmadiyya Muslim Community in various parts of the world. He said that it had established hundreds of schools and dozens of hospitals providing education and healthcare to people living in the most deprived parts of the world, irrespective of social background or belief. Earlier in the day, His Holiness, Hazrat Mirza Masroor Ahmad directly addressed the members of the Lajna Imaillah (Ladies Auxiliary Organisation) regarding the teachings of Islam in relation to gender equality. His Holiness rejected the allegation that Islamic teaching promoted gender inequality. He explained that Islam took into account nature and so had allocated differing roles for men and women in some respects, however such differing roles did not undermine the principle of gender equality. 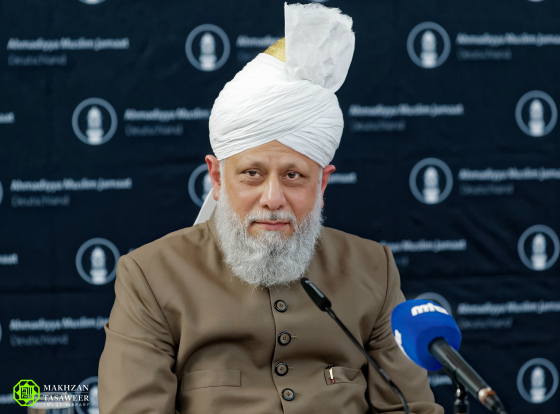 Share the post "Hazrat Mirza Masroor Ahmad addresses non-Ahmadi guests and members of Lajna Imaillah on day 2 of Jalsa Salana Germany"